We are a trustworthy Manufacturer, Suppliers, and Traders of O Rings, which are duly tested by our experts on different parameters of quality so that the perfect range is delivered to the clients. An O Ring is also known as a packing, or a toric joint and is in the shape of a torus; it is a loop of elastomer with a disc-shaped. The O Rings is in high demand among the clients. 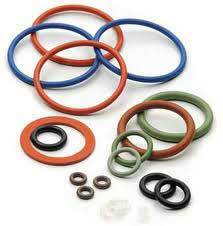 Our O Rings is precisely designed by our team of experts maintaining the market standards.